Filed to: It's Stef Bait too!Filed to: It's Stef Bait too! 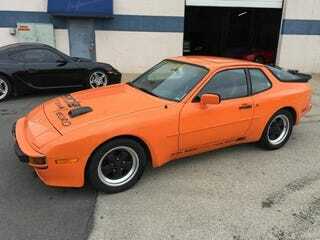 Orange you glad it’s a 944!? All NEW items include: rear tires, timing belt with pullies, less than 2k miles on new clutch, battery, alternator, master & slave clutch cylinder, front seal, valve cover seal, rad hoses. Has AC but removed switch for guage. 16" Sachs Porsche Rims, sport seats, 4 point seat belts, 1000 watt stereo/Bluetooth system, white indiglow instrument cluster, Momo steering wheel (have stock steering wheel too), ECU chipped +17hp, 13 torque, Sachs header, adjustable fuel regulator, CV axles changed within 2k miles, aftermarket fuel PSI, oil PSI, air/fuel gauges.